Peroneal retinacula are 2 thick bands of deep fascia on the lateral side of the ankle which keeps the long tendons of peroneus longus and peroneus brevis in position while acting as a pulley for them. The superior peroneal retinaculum is a thickened fibrous band of deep fascia situated just behind the lateral malleolus. Anteriorly: It’s connected to the rear of the lateral malleolus. Posteriorly: It’s connected to the lateral surface of the calcaneum and superficial transverse fascial septum of the leg. The tendons of both peroneus longus and peroneus brevis is located deep to this retinaculum in one compartment. The tendon of peroneus longus is located superficial to the tendon of peroneus brevis. Both these tendons are enclosed in a common synovial sheath. The inferior peroneal retinaculum is a thickened fibrous band of deep fascia situated anteroinferior to the lateral malleolus. Superiorly: It’s connected to the anterior part of superior surface of calcaneum, close to the stalk of inferior extensor retinaculum. Inferiorly: It’s connected to the lateral surface of calcaneum. 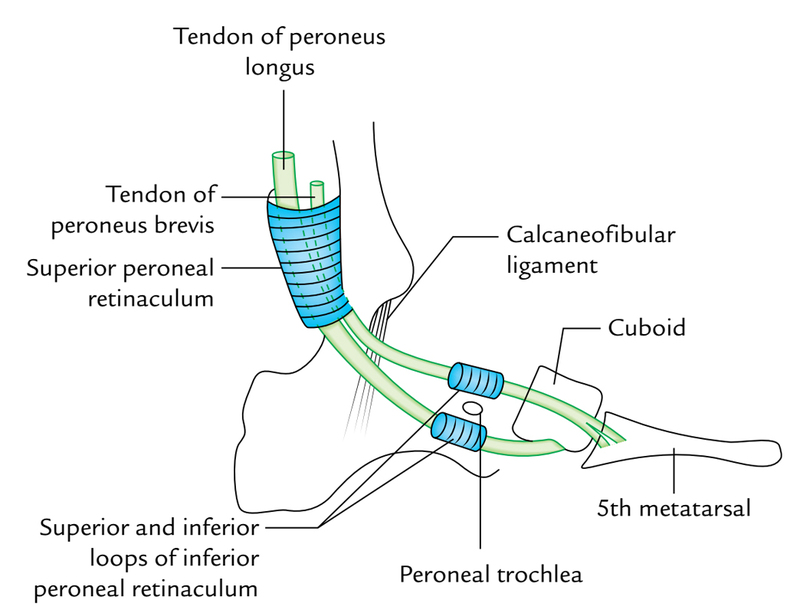 In between: It’s connected to the peroneal trochlea, hence creating 2 loops, 1 for the tendon of peroneus brevis and other for the tendon of peroneus longus. The tendon of peroneus brevis goes through the superior loop and that of peroneus longus via the inferior loop of the inferior retinaculum. Every tendon is enclosed in a different synovial sheath, that are the prolongations of the common synovial sheath above, underneath the superior peroneal retinaculum. The synovial sheaths enclosing the tendons of peroneus longus and peroneus brevis are subject to clash and inflammation in athletes who wear tight shoes.